Just up the street from the ranch, they found a man in the road that had been hit by a car. The ME pronounced him dead at the scene, zipped him up in a body bag, and sent him to the Louisburg morgue for an autopsy. But he was not really dead . . . . In a bizarre case of mistaken death, Mr. Green woke up in the morgue, quite alive, but sadly, not too well. He is still in a nursing home . . .
During a second examination at the morgue, Green's eyelid twitched several times and that Purdue said it was merely a muscle spasm, "like a frog leg jumping in a frying pan." Imagine waking-up in the morgue! 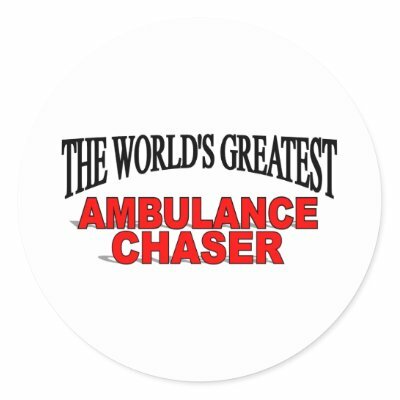 While the person who hit Mr. Green (the person responsible for his injuries) has not been identified, the lawyers are seeking any "deep pockets" and suing anybody involved, including the Good Samaritans who tried to help him, the paramedic rescue workers. His kinfolks have already rejected a million dollar cash offer, and are now suing for even more cash. This is a tragedy, but it’s the fault of the person who hit him, not the city, and not the paramedics. I also hear that his injuries were so severe that earlier treatment would have made no difference in the outcome. Even though North Carolina has a Good Samaritan Law it does not apply to paid workers, and it does not keep the victim from blaming you for their injuries! Blaming the Good Samaritan for causing an accident happens far too frequently . . . .
A few years back I sat on a jury where a victim blamed a Good Samaritan for causing her accident! The poor man's only crime was stopping to help, and as a reward, the victim accused him of causing the accident! There is a lesson here, and it's not a good one. If you see somebody dying beside the road, keep moving. If you stop, their lawyer could accuse you of causing the accident . . . When it's time to sue, the lawyers have no problem suing everyone involved, witnesses, bystanders, paramedics, ambulance personnel, you name it, anybody with deep pockets is fair game. Some States do not have Good Samaritan laws, and it’s a shame that if you try to stop and try to assist someone in California, you could get sued! I’ll bet a lot of people are going to die because of this nonsense . . . Boogie bird dances to Ray Charles music! What’s a Frenchman’s favorite saying? Sieg Heil: We are the master race!